Awaken and indulge your senses! Immerse yourself in the natural wonders and colorfully rich traditions of Bali, Indonesia. In the world's most idyllic setting, we will engage in creative movement and flow, reawakening your innate ability to move with radiant energy. Harness your intuition, strength, and serenity through the enchanting mystique of Bali, Indonesia. Heed Yourself Bali Retreat with Naheed Radfar is a unique experience in paradise to harmonize the body, mind, and soul. 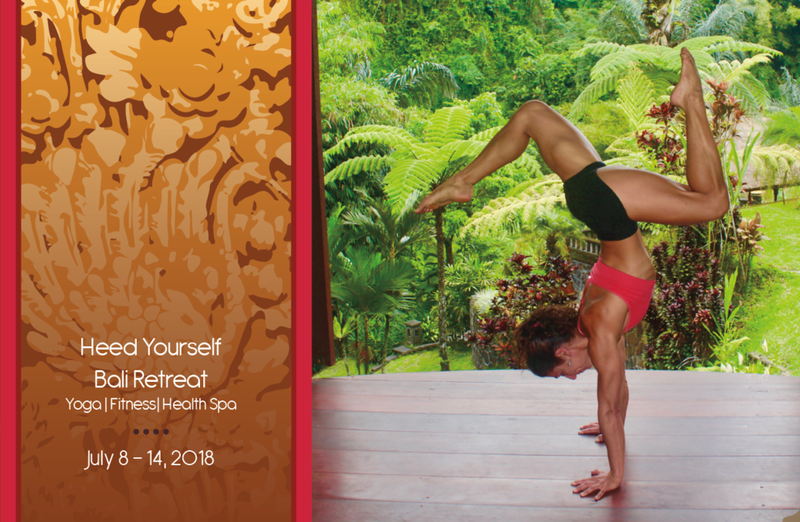 With twice daily yoga offerings, fitness classes, Balinese dance lessons, and specialty workshops, we will explore both active and restorative modes to encourage balance. A variety of spa amenities - a complimentary Balinese massage, hot jacuzzi, herbal steam room, fresh-water infinity pool, and full service gym - ensure that you are fully pampered during your stay. Celebrate vibrant Balinese culture with a traditional opening ceremony blessing, the famous Gamelon music and dance performance, and instructional wellness workshops preparing natural remedies and delectable Balinese food. Visits to historic temples, colorful markets, artisan shops, and delicious restaurants immerse us in the flavor of local life. Seek adventure by trekking through nearby jungle and Tegallelang rice paddies, soaking in volcanic hot springs atop Mt. Batur, and making new friends in the renowned Ubud Monkey Forest. Luxuriate in a 5-star Health & Wellness Resort amidst tropical landscapes, landmark temples, and harmonious artisan communities. The venue is nestled in spectacular terrain crafted to create an environment of rejuvenation. Each private villa features a veranda where guests can enjoy stunning views of mountains, valleys, and lush flora. Embark with us on this unique and once-in-a-lifetime journey to the exotic lands of Bali, Indonesia. As a community that encourages individuality and personal growth, all levels are welcome. We look forward to seeing you in paradise!